I've been a naughty boy. 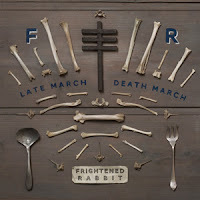 The latest Frightened Rabbit album has escaped my listening, since its February release. The band are releasing a new EP tomorrow, partly to remind people about 'Pedestrian Verse' and partly to showcase some new tracks - including a collaboration with Manchester Orchestra. Check out a couple of versions of the title track from the 'Late March, Death March' EP below. 'Late March, Death March' appears on the new album, 'Pedestrian Verse', but doesn't quite match the likes of previously featured tracks 'The Woodpile' and 'State Hospital'. However, I am rather enamoured with the alt version of 'Late March, Death March' - reflecting a more melancholic sound that the band have built their reputation upon. 'Late March, Death March' EP is available to pre-order at amazon.co.uk. Find more info at frightenedrabbit.com.